Twenty-five carats of genuine ruby kids, and on a slightly longer tapered wood hair stick too, so those of you with "fluffy" hair can set the dangle a bit further out if you like! Genuine ruby gemstone beads dangle suspended from ornate sterling silver filigree at the end of this one-of-a-kind special edition Japanese kanzashi-style hair pin. Three genuine ruby gemstone beads, two of which are faceted and nestled into ornate sterling silver flower bead caps, bringing the total ruby carat weight to 25 carats, adorn the hair stick. Silver plated heishi beads complete the hair jewelry design. The hair stick is elegantly tapered wood, hand painted in satiny jet black under layers of protective clear enamel. 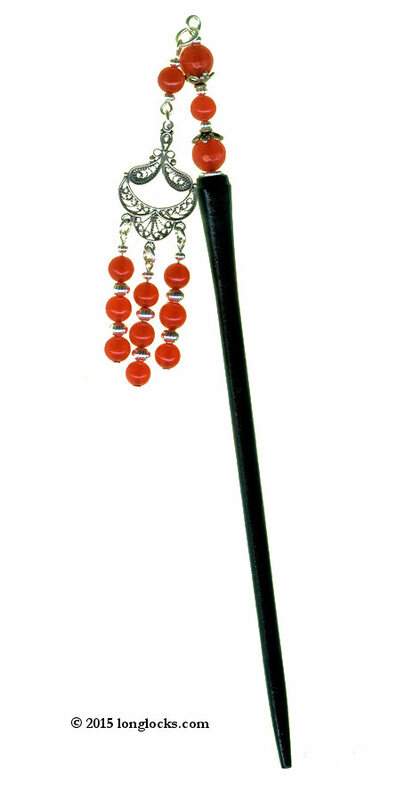 This archived Ruby LongLocks GeishaStix hair pin measures approximately 7" long from end to end (excluding dangle). The dangle measures 3 1/4" in length.